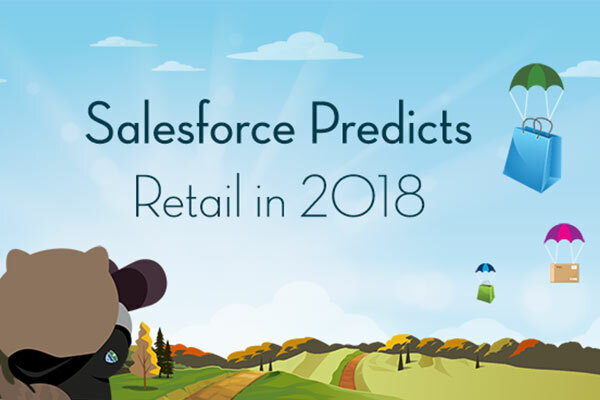 Welcome to our third annual Salesforce Predicts series, where our global thought leaders and subject-matter experts, who live on the front lines of retail, leverage their expertise and experience to predict what retail and commerce will look like over the coming year. Digital commerce has been the sole focus of Salesforce Commerce Cloud since 2004, when it amounted to just 2% of all UK retail. Our expertise in helping global brands grow, together with our Shopping Index – which analyses the online shopping activity of half a billion shoppers – gives us a powerful perspective into granular historical ecommerce trends. Such insight also provides us with an intriguing glimpse into commerce’s future. 2018 is the year personalisation goes completely mainstream. Simply put, personalisation will become the new mobile. That is, shoppers will expect a personalised shopping experience just as they do a great mobile experience today. More retailers will offer AI-based personalisation than those who do not. To compete with entrenched marketplaces like Amazon and emerging subscription models, more retailers will turn to AI-based capabilities (product recommendations, email, personalised product pages, etc.) to better match shoppers and products. There are already dozens of brands running more than 600 global sites using Einstein Product Recommendations. More retailers will offer personalised curated collections – Stitch Fix was a pioneer but many others are getting into the game – allowing them to collect more customer data and establish greater brand loyalty. - Rick Kenney, Head of Consumer Insights and Kristyn Levine, RVP, Global Retail Practice. Retailers, in an effort to more effectively compete and gain the upper hand with all-knowing consumers, move from fixed prices to a “live trading” model, moving prices up and down, item by item and region by region. The technology is available to retailers today to monitor competitor’s prices in real time, and to execute a dynamic pricing strategy. It is now about making the commitment to this approach and supporting the trading teams to achieve success. This fascinating article from The Atlantic explores how simple discounts and standard prices are already giving way to far more exotic strategies. Voice and visual search usurp typing, swiping, searching and scrolling in 2018, and will bring consumers closer to purchase much faster. Voice will become the new user interface as Amazon Echo, Google Home, and Siri become part of our everyday lives, not just for searches and information but for buying products. In order to prevent further disintermediation, brands will partner with these companies to deliver their own voice-driven experiences. Some early adopters including Tide, Johnny Walker, Campbell’s Soup and Liberty Mutual, in late 2016 launched branded voice experiences with minimal success. But as voice technology improves and becomes more ubiquitous, and consumers become more comfortable using it, there is no doubt it will take off – and soon. At the same time, visual search will become far more prevalent as A) consumers want to be able to immediately discover products they see in real life and B) retailers seek to reduce the steps to get to purchase. Many brands will unfortunately continue to underinvest in training their store associates; these brands will fall further behind their peers who do invest and put AI-powered mobile apps in associates’ hands to empower them to engage with shoppers in compelling new ways. That said, stores will continue to be the centerpiece for brands to raise awareness and attract shoppers, but formats will change dramatically, and fast, as strange bedfellows come together to reach new audiences. Some examples: Birkenstock and Barney’s have partnered on a ‘pop-up box’ concept in NYC; Engelhorn brought a Tesla showroom into its Mannheim, Germany flagship store; Nordstrom opened Nordstrom Local featuring wine and manicures but no merchandise. By some estimates, as much as 30% of apparel bought online gets returned; it’s frustrating for the shopper, who wants the item to work, and the retailer, who have to bear the cost of repackaging, shopping and restocking. The reason for the high rate of return is most often the fit. More retailers will finally step up their game with technologies like True Fit that help shoppers choose the right size. Some examples: Rebecca Minkoff’s “size me up” feature which displays handbags in proportion to everyday items (laptops, water bottles, magazines), and Levi’s “virtual stylist,” which combines AI, natural language processing and social media scraping to help shoppers choose the right model and size jeans. Forward-thinking retailers will use proportion-based visuals to show how a dress will look on a 5”1 person and a 5”10 person. Shoppers will become loyal to brands whose apparel products they know will work for them. 2018 will be the year when agile methodologies will fully expand beyond IT to all aspects of retail business operations. For example, digital commerce leaders will manage content production in sprints, embracing similarly managed split tests as a means to course-correct. Content will be more effectively localised under shorter, more frequent planning cycles. High performance operational teams will adopt many of the agile practices of their project and IT counterparts, from Kanban boards to stand-up meetings. This will require business leaders to accept a degree of ambiguity and overhead in exchange for a less predictable but more relevant outcome; pioneers are already finding that the benefits are worth the challenges of this cultural shift. Driven by the need for agility, change management will become a key internal business function. Social media-driven traffic to retailers’ mobile sites is firmly on the upswing, with a 42% increase in 2017, according to the Shopping Index. We know consumers increasingly look to social for influencer suggestions and inspiration from family and friends on what to buy next. But in 2018, we’ll see social’s influence on mobile traffic become even more pronounced as networks like Instagram make it simpler for consumers to visit a product detail page and browse mobile sites directly from social content. In fact, Commerce Cloud now has a pre-built integration that makes it easy for brands to create shoppable content on Instagram business accounts. And with more sites implementing Apple Pay (see how Wolverine Worldwide does it) and Android Pay on checkout pages or right on the PDP, expect the journey from “I saw it on Instagram!” to “It’s mine!” to get even shorter. Amazon, in an attempt to own the last mile to the customer, will make its next big bet on logistics. We see some clear signals that indicate this outcome – the Whole Foods acquisition brings Amazon in direct contact with its customers. This solves the last-mile challenge by enabling Amazon to own the delivery experience of its products. Amazon Stores is another experiment that indicates it wants to circumvent logistics altogether where possible. Amazon recently filed a patent for a delivery drone fleet management hub that indicates that, maybe in the near future, more packages will be delivered through drones at the expense of courier vans. Its move into logistics spells bad news for big carriers that derive huge sums delivering Amazon packages, but good news for smaller players who may find new opportunities. So that gives you a sense of where some of retail's leading lights see change coming in 2018. But there's always room for more insight, especially at this time of year. Check out Gartner's Digital Commerce Magic Quadrant report for a deeper dive. And one last prediction we hope comes true – a most successful and happy 2018 to you all!